‘Tis the season to listen to the same 20-odd pop songs on repeat in order to forcibly celebrate the holidays and construct a jovial atmosphere over soggy Brussels sprouts. 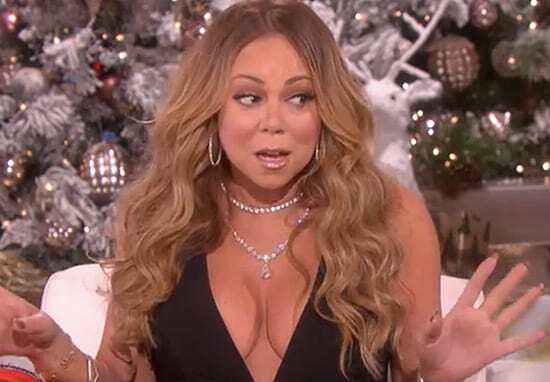 Mariah Carey celebrates harder than the rest of us, apparently, considering she gets a little Christmas bonus every year for doing absolutely nothing. The starlet and her vocal range have become synonymous with festivities. The pop star earns £376,000 every year from the royalties for All I Want For Christmas, co-written and produced by Walter Afanasieff, straight into her pocket, reports the Telegraph. A drop in the ocean for a woman worth $520 million, as of December 2016, according to BankRate, no doubt. But it’s not the Christmas song she’s so well known for that earned her all that money. She’s the best-selling female musician in Billboard history and some of her biggest singles have spent 128 weeks on the charts, and in terms of No. 1 singles, she’s second only to The Beatles. But with all that spare cash lying around at Christmas, perhaps she could donate it to universal therapy for those of us who are force fed the Christmas jingle annually against our will in all public spaces. So next time you’re dancing around the tinsel tree with Mariah and the classics from her 1994 Christmas album, just remember, she and money really do belong together. She’s now branched the Christmas catalogue out, to include movie memorabilia, and digital personalised greetings cards with other tat thrown in. Mariah is even blagging sales of the song, with giveaways of free autographed booklets with every purchase. There’s even an Amazon Prime animated movie out this year, about Mariah’s first love apparently and a semmingly spoilt kid who demands a puppy for Christmas, according to Carey’s twitter feed. The irony – a ditty dedicated to love and harmony over material possessions earning such vast quantities of money for a millionaire – is lost on literally no one. Funnily enough, despite Mariah’s stunning vocal range and soulful tones, the best version was obviously sung by young Joanna in Love Actually. There’s a lot of money to be made during the commercially curated holiday season, with Slade’s Merry Xmas Everybody, which was released in 1973, topping the tree of high-earning tracks. Its songwriters, Noddy Holder and Jim Lea, reportedly cashed in on £500,000 in estimated royalties from their song in 2015 and the uniquely screeching opening lyric. Joining them will be The Pogues, who rake in around £400,000 each year from their ballad The Fairytale of New York, which was apparently written to win a bet with Elvis Costello, who said they couldn’t write a Christmas song. All I Want For Christmas is some respite for this truly anger-inducing jingle. Along with the talent to write a festive one-hit wonder and live the life of Riley forever more. Slade, the Pogues or Mariah: who makes the most at Christmas?